Here we spend time studying the meaning of the words and then we try to put them into meditation and practice for making our mind more calm and happy. PROGRAM CHANGE: The third subject of the Basic Program “Heart Sutra” will start April 23th. Please submit your application by Sunday April 7th 2019. 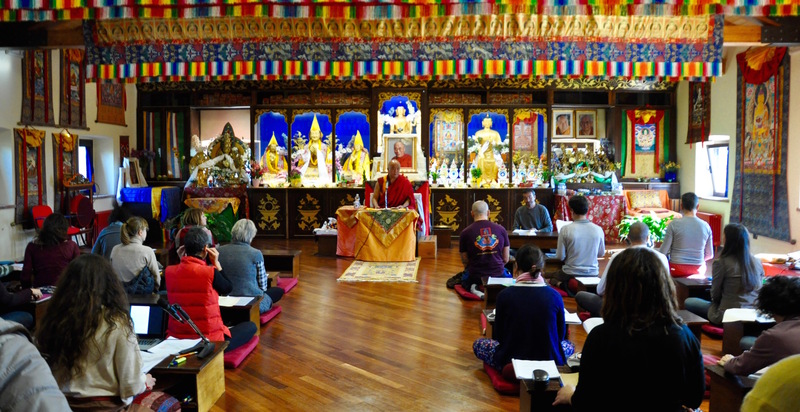 The Basic Program is an In-depth FPMT education program in the Tibetan Buddhist tradition designed by Lama Zopa Rinpoche It offers a balanced approach, combining academic training and meditation practice. ILTK’s fourth Basic Program starts September 2018 and finishes June 2022! The Basic Program is intended for students who wish to progress beyond foundational level courses and are ready to commit themselves to in-depth study and practice. The Institute offers the program both residentially and online. The program is composed of nine subjects. Daily teachings are combined with review classes and discussion groups, meditation practice, reflection on one’s ethical behavior, and community service. These are integral components of the program. Students from the University of Pisa can follow individual subjects of the Basic Program. 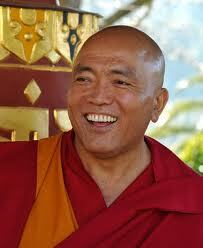 Geshe Tenzin Tenphel was born into a nomadic agricultural family in Domo, Tibet, near the Indian province of Sikkim. In 1959, with the Chinese invasion of Tibet, Geshe Tenphel’s family fled to Sikkim and later to South India. Geshe Tenphel became a monk when he was nine years old and continued studying at the local secular school while memorizing Buddhist scriptures during his holidays. 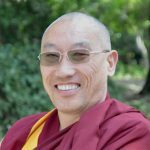 Geshe-la entered Sera Je monastery at the age of 17, where he completed 21 years of monastic scholastic education, graduating with honors in 1994 with a Lharam Geshe degree, the highest Tibetan Buddhist doctorate conferred in the Gelug tradition. Geshe Tenphel then studied tantra for one year at Gyu To Tantric College. Since January 1998, Geshe Tenphel has been resident teacher at Lama Tzong Khapa Institute, where he teaches numerous courses including the Basic Program. Geshe-la is much appreciated for his teaching style being humorous, practical and uplifting and he specially links his teachings to daily life. He gives direct instructions on how to practice and transform our minds. Geshe Jampa Gelek was born in 1966 in the eastern region of Kham, Tibet. He decided to become a monk early in life. At the age of 16, due to the Chinese invasion, he left Lhasa and went to India. He studied at Sera Je Monastic University, where, at a very early age of 19, he became a fully ordained monk. His Holiness the Dalai Lama and Choden Rinpoche are his main teachers. In 1999, being awarded the title of Lharampa Geshe, he continued his education with the study of tantra, qualifying him to give empowerments and commentaries. Since 2012, together with Geshe Tenzin Tenphel, he is resident teacher at Lama Tzong Khapa Institute. Geshe Gelek teaches the Masters Program in a very dedicated and enthusiastic manner, sharing his amazing vast and profound knowledge with us. Mind and Cognition begins with the study of mind, both in its valid and distorted forms. In addition a number of important themes are introduced, including the relationship between subject and object, supramundane (yogic) knowing and the connection between thought and reality. An introduction to Buddhist psychology forms the latter part of the teaching, where the various positive and negative emotions as well as the cognitive states relevant to practice of a liberative path are identified and defined. Based on the idea that the Buddha taught different things to different people in line with their capacities, Tibetan scholars systemized the numerous trends in Indian Buddhist thought and taught the four schools of tenets as a means to approach the most profound philosophical teachings via more accessible levels. 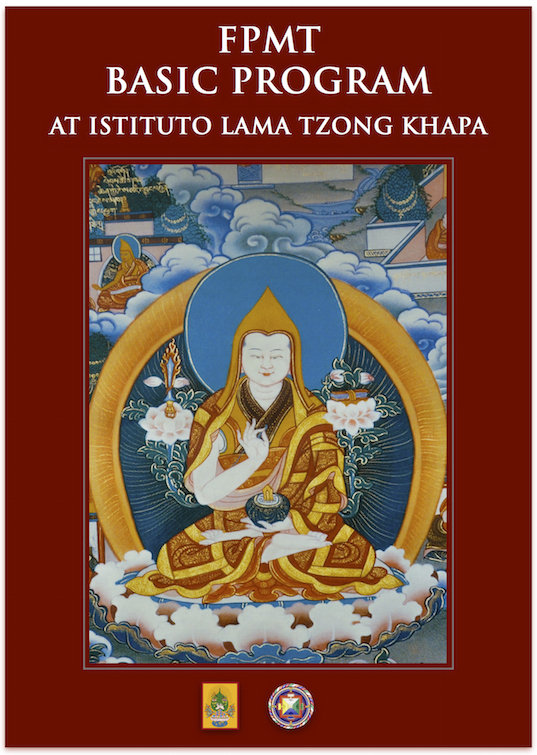 The text that is the basis for study of this subject gives a brief overview of the assertions on minds, objects, selflessness and the nature of attainment within each of the schools, culminating in the tenets of the most highly esteemed school, the Madhyamaka. Among the most famous of all the Buddhist scriptures, the Heart Sutra reveals the truth of emptiness through a short exchange between two of the Buddha’s most illustrious disciples, Avalokiteshvara and Shariputra. Traditional commentary expands on the cryptic style of the sutra to clarify the exact nature of the wisdom realizing emptiness and the ‘method’ practices that are its essential complement, relating these two aspects of practice to the five levels on the path to enlightenment. The brevity and profound nature of the Heart Sutra have made its recitation popular as an effective means for dispelling obstacles to spiritual endeavour. The celebrated system of teachings known as the Stages of the Path (lamrim) represents a synthesis of the entire path to enlightenment. Presented in a clear and concise form, these teachings are easy to understand and apply in meditation. Instruction begins with the preliminary practices, and then progresses through the essential practices of the ‘beings of the three scopes’, including correct guru devotion, renunciation, the altruistic wish for enlightenment and the view of the middle way. As a foundation and context for Buddhist practice, this subject is a key element of the Basic Program. The Mahayana path is characterized by the bodhisattva’s aspiration to become a buddha for the sake of all beings. The means to develop and enhance this extraordinary attitude are revealed in a genre of teachings, at once practical and radical, known as ‘mind training’, or ‘thought transformation’ (lojong). Dharmarakshita’s Wheel of Sharp Weapons is one of the most esteemed mind training teachings, and a powerful weapon to cut through our true enemies – the self-grasping and selfcherishing which oppose altruistic intent and prevent lasting happiness and peace. The teaching on the bodhisattva’s deeds is based on Shantideva’s inspirational verses on Mahayana aspiration and practice, composed more than a thousand years ago and still widely regarded as the most authentic and complete guide for the practitioner dedicated to the enlightenment of all beings. This highest of motivations lies at the heart of his Guide to the Bodhisattva Deeds, which ranges in scope from simple, practical techniques for developing generosity and dealing with destructive emotions, up to the most refined discussion of ultimate truth. Due to its authenticity and relevance for everyday life, this classic is probably cited more often in teachings by Tibetan Buddhist masters than any other Buddhist scripture. One of the major texts studied in all traditions of Tibetan Buddhism, Maitreya’s Sublime Continuum clarifies the meaning of our Buddha potential, in particular the emptiness of the mind that allows evolution to a state of complete enlightenment. The first chapter of this work, which explains four related ‘vajra’ subjects – Buddha, Dharma, Sangha and the Buddha potential or tathagata essence – will be the focus of this teaching. Maitreya’s Ornament for Clear Realizations is the root text for the study of the levels of realization related to enlightenment according to the Madhyamaka school. This important scripture, traditionally the basis for extensive study in the monastic curriculum, made explicit these levels which were otherwise presented in only a hidden manner in the Buddha’s Perfection of Wisdom teachings. From among the seventy topics covered by the Ornament, the eleven topics of chapter four have been selected for commentary in the Basic Program curriculum. Grounds and Paths of Secret Mantra offers a concise overview of the structure of the tantric path, widely acclaimed in Tibet as the swiftest and most sublime means to realize buddhahood. Tantra distinguishes itself in particular through a unique combination of method and wisdom, achieved through meditation on the perfect form of a buddha as completely devoid of true existence. Presenting the paths of all four classes of tantra, while not being a guide to highest yoga tantra practice itself, this subject provides a clear overview of its complex path structure. In order to study this subject it is necessary to have taken refuge, which implies making a life-long commitment to the Buddhist spiritual path, and to have received a highest yoga tantra empowerment. A highest yoga tantra empowerment must have been received from a qualified teacher and entails taking the bodhisattva and tantra vows along with the commitment to do the Six Session Guru Yoga practice on a daily basis. To study the Highest Yoga Tantra commentary, these commitments are required in addition to the specific empowerment related to the deity of the commentary. She holds a degree in Orientale Studies – Tibetan and Hindi languages – at the University Ca’Foscari of Venice. From 2009 to 2014, she lived in Dharamasala, India, where she studied Tibetan language and under the guidance of Geshe Lharampa Tsewang Nyma of Drepung Loseling monastery, she has concluded four years of philosophical studies in the traditional monastic curriculum. She attended lectures and courses at LTWA (Tibetan Library of Works & Archives), IBD (Institute of Buddhist Dialectics) and received many teachings from H.H. Dalai Lama and other teachers. In October 2014, she graduated from LRZTP (Lotsawa Rinchen Zangpo Translator Program) in Dharamasala, India. She speaks Italian, English, Tibetan and Spanish. Rita was the Italian and English interpreter of the third Masters Program for the last 4 years, interpreting Abhisamyalamkara and Madhyamaka. 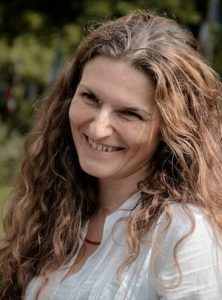 She holds a degree in conference interpreting and translation from University of Ljubljana (Slovenia), and was trained for the English retour at University of Bradford (UK), as a European Parliament fellow. She has served as an English interpreter for the Basic Programme 2015 – 2017 at Institute Lama Tzong Khapa. Joan holds a degree in psychology. He graduated from the second FPMT Masters Program in 2014, having completed the one-year retreat requirement in O Sel Ling in Spain. 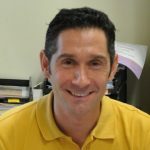 Since 2015 he is one of the tutors of Istituto Lama Tzong Khapa’s BP Online, while also serving as the teaching assistant for the Italian and English residential students. Valentina, with a background of 20 years in the PR and communications field and co-founder of a high tech service company, participated in ILTK’s first residential Basic Program. 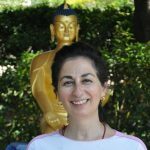 She continued her studies to graduate from the second FPMT Masters Program which she completed in 2014 with the one-year retreat, adding to her many individual and group retreat experiences. 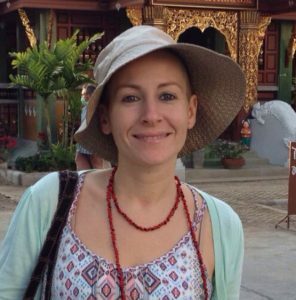 Since 2015 she tutors the Italian online Basic Program at Istituto Lama Tzong Khapa. In order to develop a basis for meditation, Buddha taught the importance of listening to the teachings and contemplating them as a way to attain a clear comprehension of the path to enlightenment. According to a Tibetan saying: “The one who meditates without having listened to the teachings is comparable to the one who tries to climb a snow mountain without using their hands”. Each of these phases, listening, studying and contemplating, and meditating, leads respectively to the wisdom that arises from listening, the wisdom that arises from contemplation and the wisdom that arises from meditation. To this end the Basic Program was especially designed to offer a balanced approach that combines the academic training and meditation practice which characterize the Gelugpa tradition of Tibetan Buddhism, and to gain practical and immediate benefit from the study and comprehension of the philosophical subjects. Online Basic Program participants as well are suggested to plan regular meditation sessions throughout their studies. Topics of meditation related to the subject that is being studied will be proposed by the teaching assistant and online tutor. 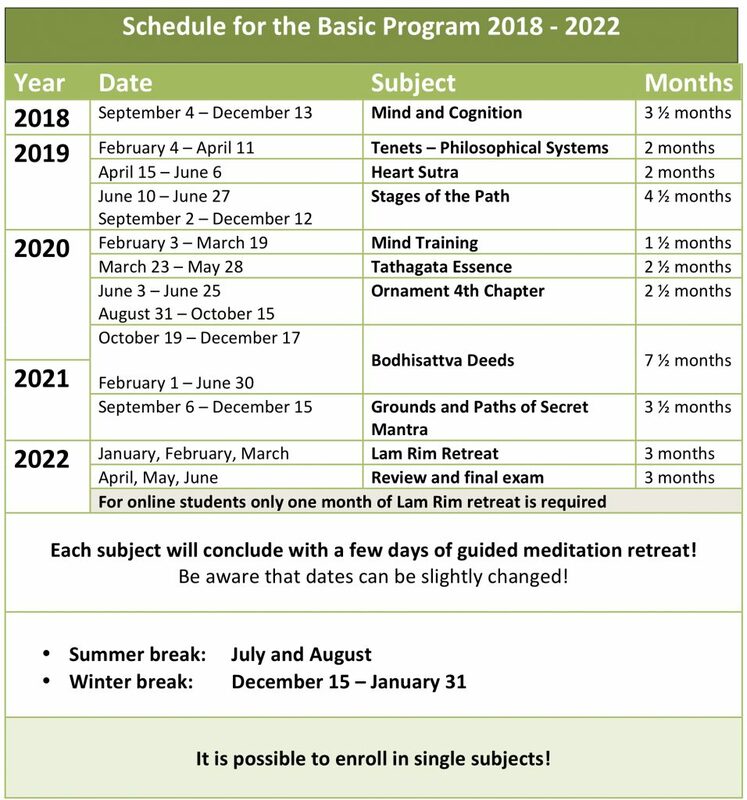 During the Basic Program group meditation retreats will be organized to encourage the integration of the teachings into one’s practice, and online students are strongly encouraged to take part in these retreats if at all possible, or to conduct such retreats at home. Learning Dharma means less ignorance, more wisdom. It means more light in your life, in your mind, no darkness. That means you have more freedom in your life to achieve liberation from samsara, great enlightenment. The more you understand Dharma means you can educate more, benefit others more, give more light to others, you can cause them to have deeper and clearer understanding of the Dharma. The benefits of preserving Dharma can’t be explained by all the omniscient ones, the Buddhas, even for eons. The more you hear Dharma, it plants more seed of liberation and enlightenment. It makes it so much easier for future lives, easier to achieve liberation and enlightenment. You have a good qualified teacher. Therefore take the opportunity to learn Dharma. Don’t waste your precious human life.